Respect the breakfast… The morning after and all that really matters. I like sunrises. Usually, I calmly wait for the sun to rise each morning. It’s a reminder of not just a new day, but all things have become like new. It is spiritual and emotional strengthening. No, I’m not romanticizing the big decisions we delay, the degree or gradation of yesterday’s hard places we cannot escape, but to know we start anew each day is worthy of a morning hug. It is hope and surprises (some pleasant and some… well, not). This morning was pleasant… It was delightful and deserving of a celebration. Fortunately, we just accepted delivery of fresh country eggs from a local farm and had a day-old loaf of French bread on hand. 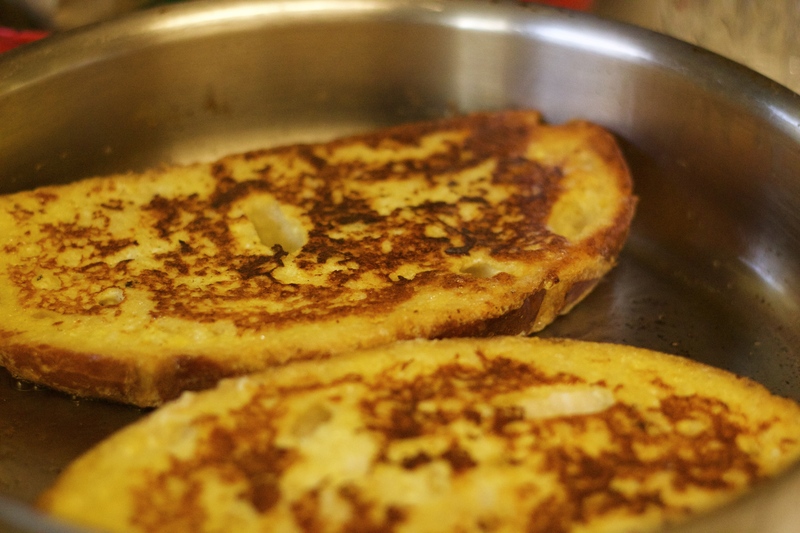 It’s not a Sunday, but what is better than French toast for breakfast? The glycemic index of maple syrup (54) is about half of regular sugar (though higher than coconut palm) and it is more nutritious (this includes anti-inflammatory properties). The bread a little higher with a glycemic index of (95) and a slightly under-ripe banana with a 45-52 GI. Overall, pretty good considering Bananas Foster French Toast with Vanilla Bean! A slight sprinkling of cinnamon which naturally lowers your blood sugar and the green light for this dish was steady. As a preventative measure to control blood sugars, my search to re-invent a healthier version of meals is unrelenting. Generally, I have found great meals without the heaviness of overly rich foods. My egg mixture for our French Toast consists of eggs and mil k… vanilla extract or vanilla scraped from the bean (my preference). Our bread purchases are from artisan bakers or baked where we shop (primarily Whole Foods) for healthier options. After soaking the bread, I use whole kernel virgin coconut oil and cook over low to medium heat for a nice brown and doneness. The real treat is the maple-syrup caramel. It is simply a 1/4 cup or so of maple syrup. 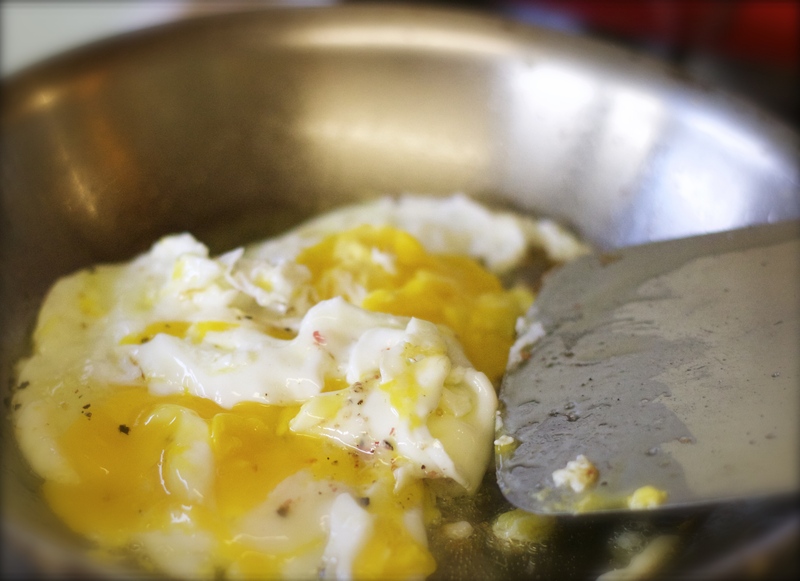 Carefully pour this directly into the hot skillet after removing the toast adding a teaspoon of butter (European butters for a healthier and better fat content). Give it a few swirls, toss in sliced bananas for the last big swirl. Make sure your fruit is coated and then pour directly on partially stacked toast. Yum and then yum. The morning sun was the star of this meal; the French toast is a lovely à la carte served with lightly scrambled eggs and freshly squeezed orange juice. All done to perfection in my TINYKITCHEN with a really GREATTASTE to make satisfied a BIGHEART with happiness for those I lovingly serve. Why it took me so long to transform maple syrup into caramel… I will never know. It is amazing. Thank you. ← “IF” A Picture Paints a Thousand Words… Why Can’t I?